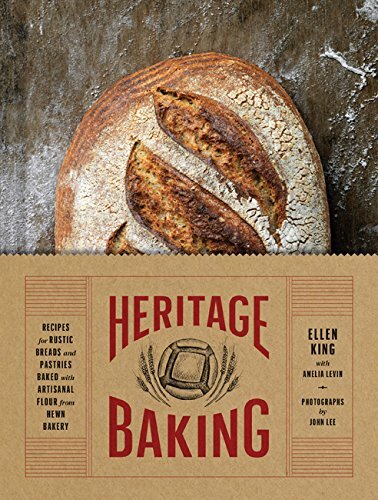 With recipes calling for freshly milled flours and natural starters, Heritage Baking will be a welcome addition to the libraries of America’s growing number of ambitious, health-conscious cooks. Author Ellen King, a classically trained chef and one-time historic preservationist, is co-owner of the popular Evanston, Illinois, bakery called Hewn. With the help of her business and life partner, Julie Matthei, King churns out hand-forged rustic breads daily, all made from flour milled close to home. Hewn is part of the explosion of U.S. bread bakeries that uses organic, locally sourced flours and natural fermentation. As in most of these establishments, King’s modern way of baking goes back to antiquity, when there weren’t such things as additional gluten, fast-acting yeasts, refined sugar, and preservatives. For those unfamiliar with the world’s myriad flours, King gives a primer on general flour types, protein and gluten ratios, and milling extraction rates of bran, germ, and endosperm. She advocates for buying whatever is grown locally. If ready-milled flour isn’t available, she encourages grinding your own. Living in the Midwest, King has easy access to such esoteric wheat varieties as Turkey Red, Red Fife, Marquis, Rouge de Bordeaux, Sonora, Glenn, and Warthog. She purchases these flours freshly milled from local stone millers. The biggest challenge for readers is that all 45 recipes in this book call for at least one of King’s preferred flours, which are virtually impossible to find in typical grocery stores. King suggests substituting any local wheat that closely matches hers, and she gives a chart to help compare individual protein contents and colors. When it comes to leavening, King is a fan of home-brew sourdough. Her Hewn Heritage Starter is simply a sourdough starter made from heritage flour and water, and it sits round until it bubbles until ripe, about three days. Any student of sourdough knows how finicky a starter can be to get going and to maintain. King takes the cook by the hand on this nurturing journey by using photographs and detailed instructions, which makes the process seem less intimidating. King’s only bow to modernity is to use a little yeast in her recipes for dinner rolls and brioche, which she says takes the guesswork out of breads made with sugar and substantial amounts of butter. Recipes are divided into chapters titled Heritage Breads, Enriched Heritage Breads, Muffins and Scones, and Cakes, Cookies, and Brownies. As with most breads baked with sourdough starter, the process must begin two days in advance to properly feed the starter. The Heritage Bread Master Formula explains the entire progression by way of 16 illustrated pages of instructions. Once the meticulous master bread recipe has been conquered, home bakers will find it relatively easy to move on to everything else, from the rustic Heritage Country, a “jack-of-all-trades loaf,” to the beautifully photographed Heritage Spelt, to the mouthwatering Potato Rosemary loaf. For those who favor refined more than rustic, the Basic Brioche Dough opens the door to such temptations as plain Brioche Loaves, Feta-Dill Brioche Rolls, Cinnamon Roll Brioche, and the stale-brioche treat known as Bostock. Although the flour King uses certainly isn’t the typical over processed stuff found in most American cupboards, her recipes for sweets are grandma’s kitchen familiar. Heritage Baking offers such nostalgic delights as Lemon Pound Cake, Anise Biscotti, Lavender Lemon Muffins, and Heritage Dark Chocolate Brownies. There’s also Classic Chocolate Chip Cookies and Ginger Cookies, and a recipe for Fingerprint Cookies easy enough to make with kids. But it’s the bread, in all its crusty, rustic, sustainably grown glory, that’s the star of this niche book. Fans of Hewn will certainly flock to this volume for the bakery’s familiar recipes. A wider audience, regardless of their access to heritage, fresh-milled flours, will also be drawn to King’s artisan bread-making passion. As much as anything, that’s what Heritage Baking is: an intricate love letter to the joys of baking breads the way they were originally meant to taste. Cynthia LeJeune Nobles' most recent cookbook is the co-authored The Fonville Winans Cookbook: Recipes and Photographs from a Louisiana Artist. She is cookbook editor for LSU Press in Baton Rouge and previously wrote the "Bites of History" food column for the Food Section of the Baton Rouge/New Orleans Advocate. She also guest lectures on food history topics and teaches cooking classes.